(M/L) Mens Vintage Southwestern Sweater! Funky Navajo Designs in Neons & Neutrals! 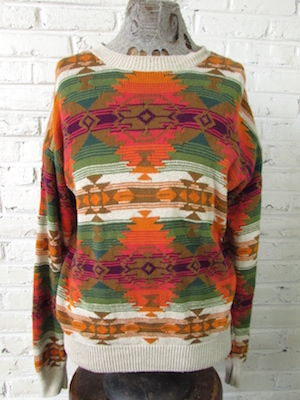 Home > Men's Vintage Shirts > All Men's Vintage Shirts > (M/L) Mens Vintage Southwestern Sweater! Funky Navajo Designs in Neons & Neutrals! 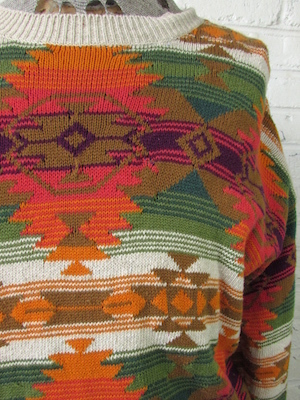 Mens vintage Southwestern sweater! Off white base with super cool navajo designs in hot pink, purple and tan. The navajo pattern sits over tan stripes and green stripes in various colors. Collar cuffs and bottom of the sweater are off white. Tagged by Nautica. 100% Cotton. Condition: Very Good. Has a little nip on the tip of the right side of the collar. Still an amazing shirt! Chest: 43" Roomy MEDIUM - LARGE. Tagged a Medium, but it measure to closer to a size Large. Please check your measurements before ordering.